One often overlooked area of preparedness is having copies of important documents which would prove your identity and possessions to the authorities should your originals get destroyed due to disaster. Katrina is a perfect example. Many families who were otherwise prepared failed to follow this advice and ran into a host of issues. When the waters receded, some residents tried to return to their homes. The national guard and police, who were guarding against looting, prevented people from entering their homes unless they could provide proper identification and proof of ownership. There were also difficulties in getting families back together after becoming separated following the disaster. Children were often put in a secure location and would only be released to parents/guardians if they could prove their identities. Even trying to file insurance claims were frustrating since most did not have their policy numbers available. Having access to your important documents is absolutely essential if you were required to rebuild your life following a disaster. What Documents Should You Have Backups Of? Where You Should Store These Backups? Having more than one backup for these important documents is essential. For example, if you choose to put your emergency docs only in your bug-out bag, it may be that a disaster prevents you from getting to that bag. Besides food, water and gear, your bug-out bags (72 hour kits) should also contain these important documents. I prefer to put them in Ziplock brand (they’re more durable) freezer bags. This keeps them completely waterproof and prevents damage. Another option where you can store your emergency documents is with a trusted friend or relative who lives outside of your area. This provides another failsafe in case your area is completely destroyed. You obviously don’t want these documents to fall in the wrong hands so it’s of primary importance that you can trust that individual and that they take the necessary precautions. For around $15-$20 a year you can store copies of your important documents in a safe deposit box. Again, I would recommend keeping them in a bank outside your immediate area. If your a customer of a national bank this gives you many options. This is one of my favorite methods. Basically you create digital copies of your important documents and then upload them to a remote server (like Gmail, Google Docs, or Hotmail). By keeping a copy on various remote servers you benefit from the fact that your document is safe from disaster. Many large companies like Google and Microsoft have disaster-recovery servers that if one server location were to be completely destroyed another would take its place without any data loss. As a graduate of computer science I am well aware of the importance and vulnerabilities of digital security. But transferring digital files across the net and keeping digital copies need not be risky. In my next article, I’ll be sharing with you how you can securely keep copies of these documents on the web. Read it here. Great article and I couldn’t agree more. If you end up in a Katrina-like survival situation the rest of the world largely goes on like nothing happened. That means when you make it out if you don’t have any identification you will be person no grata in the eyes of the U.S. government. Everyone needs to keep backups of these important documents. One thing I would disagree with and this is storing them online. While that is an easy way and can be relatively secure, you can still lose them at any time. Instead I put all of my important documents on a survival flash drive that goes in my Bug OUt Bag. That way I know I have everything, but no one else can get to it and no gmail servers can lose it. Thanks for your comments and suggestions! While any of the above options have associated risks of loss, having them stored online is in fact a very solid approach with minimal risk of losing them — assuming you know where to store them. In the next article I’ll be discussing how and where you can safely and securely store them online with almost no chance of losing them (the internet would have to no longer exist for the loss to happen). Thank you for your post you bring out an important point we need to have back up of the documents you have listed. What I found people do not take the time to prepare. 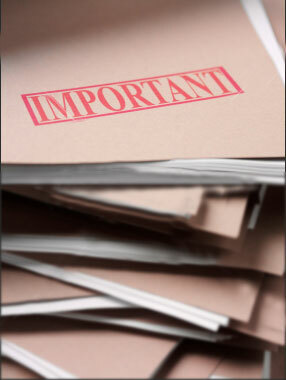 In my recent post Important Documents I have listed the Top 8 Important Documents people need to have to protect their family. Many of these documents need to have back up of them and need to be store in a safe place. I do agree with Lucas you should have digital back up and physical back up of all of the documents you have listed. There are several options available to do this.